This PDF 1.5 document has been generated by PScript5.dll Version 5.2.2 / Acrobat Distiller 10.1.3 (Windows); modified using iText 2.1.7 by 1T3XT, and has been sent on pdf-archive.com on 14/07/2012 at 20:47, from IP address 75.95.x.x. The current document download page has been viewed 789 times. File size: 110 KB (24 pages). In re SLEP-TONE ENTERTAINMENT Civil Action No. and Conclusions of Law, submitted simultaneously herewith. Reef Lounge and Package Store, Inc. (“Donovan’s Reef”), Green Glass Mall, Inc.
fair competition in the marketplace. McDonald’s Corp. v. Robertson, 147 F.3d 1301, 1307 (11th Cir. 1998). infringement depends necessarily upon the likelihood of confusion analysis. (7) existence and extent of actual confusion in the consuming public. Inc. v. Tropical Attractions of Palm Beach, Inc., 833 F.2d 1484, 1488-89 (11th Cir. confusion analysis is not numerical as to the factors. See Welding Servs. v.
approval of those goods and services. point. This factor strongly favors a finding of a likelihood of confusion. strongly favors a finding of a likelihood of confusion. Similarity between the goods or services offered under the two marks. factor again weighs heavily in favor of a finding of a likelihood of confusion. karaoke discs to patrons, which directly evidences an overlap in the customer base. although with less power than the first three factors. neither Slep-Tone nor the Defendants. finding of a likelihood of confusion. factor therefore weighs weakly against a finding of likelihood of confusion. “substantially identical” to the plaintiff’s mark). contents of the discs, placed on the disc at the behest of underlying rights holders. Marks because those marks appeared when the tracks were played. indistinguishable from, a registered mark”). pleading, a party must affirmatively state any avoidance or affirmative defense”). reasonable reading of the Trademark Act and applicable case law. been done with a single original disc. “classic” or descriptive fair use and nominative fair use. services. See Cairns v. Franklin Mint Co., 292 F.3d 1139, 1150 (9th Cir. 2002). descriptive uses of the Marks. Am. 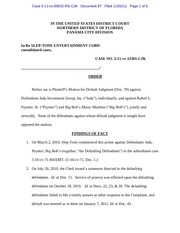 Pub., Inc., 971 F.2d 302, 308 (9th Cir. 1992). purpose; it is not necessary that they make copies of the mark in order to do that. For the foregoing reasons, the Defendants’ fair use defenses must fail. 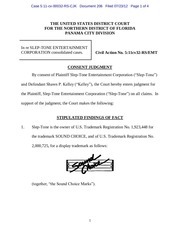 It is true that the Defendants do not compete directly with Slep-Tone. direct competition with each other for a trademark owner’s claims to be actionable. are separately applicable to different kinds of conduct. possess. All of the receipts they produced were for discs they already possessed. form the basis of a defense in this action. federal unfair competition are the same). deceptive trade practice that violates” FDUTPA). those drives, and the output of the Donovan’s Reef computer system. the tracks, to recover them forensically. The decision not to do so, undertaken in light of Mr.
recovery and analysis of the tracks, was reasonable under the circumstances. and that the initial new drive was created between those two dates. for inspection despite a court order to do so. that the evidence would have reflected negatively upon the Defendants’ position. infringement was willful and intentional. defendant must prove all elements of cost or deduction claimed. compensation and not a penalty. appropriate for its actual damages. revenues produced during “karaoke hours” at the two locations. revenues earned during that time are attributable to karaoke. starting point must necessarily be the figure as calculated under the statute. Congress to put the burden of proof of expenses on the Defendants. damages, whichever amount is greater.” 15 U.S.C. § 1117(b). goods pursuant to 15 U.S.C. § 1118. Respectfully submitted this the 13th day of July, 2012. This file has been shared by a user of PDF Archive. Document ID: 00041827.